A new layer, this time an Animation layer, is created, with its usual characteristics, above the Colo_Rendu layer, with a single empty instance. Moreover, the layer will be named by the texture name : Colo_rendu_textureBob.png for example. However, you need to stay on the CTG Layer to apply the texture, but the result will be seen on the new Animation layer. In the workspace, you will see the texture appear with a warp grid around the chosen color (here, the scarf). In the left Drawer, a new tool panel appears. On the top of the panel, you will see the name and format of the Texture, and the current image. The following parameters will help you set the texture at our convenience. Activate tracking : this option is, by default, inactive. Once checked, it will set the texture from one instance to the other by doing its best to stay true to the shape of the color zone. en respectant au mieux la forme de la zone de couleur. It will gain you some time for the application of the textures. For a manual control, do not check this option. Application will be slower, but more precise. The middle section will let us set the deformation grid, almost like the Warp tool present in the Main panel (lesson 2). Square size : depending on the displayed value, the square size will be more or less high (from 4 to 100). The smaller the squares, the more precise the deformation will be, but will also be slower to interact with. If your computer is not powerful enough, applying this function can be slowed by too meticulous parameters. The bigger the squares, the less the deformation will be precise. It will be faster to compute but you will be limited in the deformation possibilities. Rigidity : sets a value between 1 and 100 to the texture's elasticity. Size : will let you modify the size of the texture by a percent value. Auto-scale : this option is inactive by default. Once checked, it will help setting the texture from one instance to another by doing its best to stay true to the shape (size) of the color zone. The third section will let us set the look of the texture and the deformation grid. Content opacity : by default at 50%. The texture's opacity is only when displaying it, once it is applied, the texture will appear at 100% of its initial value. You will be able to change opacity directly in the Layer. Grid color : this option lets you change the grid color, i.e. the squares. You need to click on the blue (by default) square to get the picker. You can choose a color in the Color panel or in the software's interface. The adjacent value (50% by default) can change the grid's opacity. 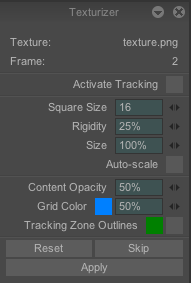 Tracking Zone Outlines : this option is by default inactive. Once checked, it will let you see the tracking zone outlines (in green by default, this color can of course be changed). Reset : lets you go back to the initial shape of the texture, unless you clicked on Apply. Skip : lets you go the next instance without applying the texture. Apply : click on this button on each instance to valide the texture, once satisfied with the results, and go to the next instance (you can also use the [Enter] shortcut). In the Bob project, once the texture is applied on the 16 instances, the Texturize tool panel disappear, and the layer is complete. The Reset button does not behave like classics reset button that goes back to the panel or function’s default parameters. The Texturize tool panel does not have this kind of reset button, you need to manually change the parameters to go back to the default ones. As for the Warp tool, you can also use pins to lock a specific location on your texture. Let's take the anchor point. We can create two anchor points on the back, and it is advised to create a third one on the neck. Once these pins are locked, we will be able to control the texture to prevent knots, and texture's rotations on itself. If you are not satisfied with the result after seeing in the Timeline, you can open the Texturize option once again. By checking Reset tracking, then Start, you ca, start again to set the texture from the beginning. If you only wish to adjust the texture on a specific instance, right-click on the instance and choose Modify texture application in the sub-menu. You will have access once again to the Texturize tool panel to rearrange the texture at your convenance.